The Truth About Dog Coats And Boots: Does Your Dog Actually Need Them? When winter hits full force, walking the dog gets a little more complicated. You can’t leave the house without first shoving your feet into warm boots and grabbing a coat, and the temperature might even call for gloves, a hat, and a scarf. You risk freezing if you don’t bundle up, but what about your fur-covered walking partner? The stores are full of dog coats, sweaters, boots, and even full-on snow suits. The advertisements say they keep dogs warm in winter, but are they actually necessary? Your dog already wears a fur coat after all. The truth is, every dog is different. Whether or not your pup needs to dress up for winter will depend on these factors. With a built-in fur coat, putting a dog coat on your pup seems silly and unnecessary—even dangerous. 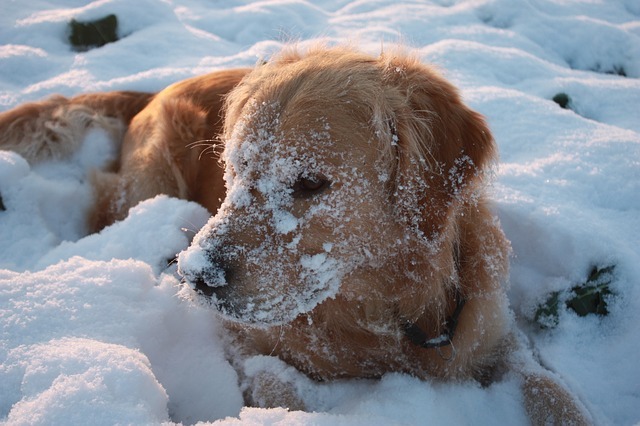 In certain situations, putting a heavy coat or sweater on a dog could cause them to overheat or injure themselves. For some dogs, however, extra layers of warmth are essential during winter. It all depends on your individual dog and the specific situation. If your dog falls into one of these categories, you should consider bundling him up in a dog coat before heading outside on a cold winter’s day. The biggest factor in whether or not a dog needs a coat is their fur. If it’s long and thick, like a Husky, Newfoundland, or Akita, your dog already has what he needs to stay warm. But if it’s short and thin, an extra layer of warmth will be a good idea. Certain breeds are built for cold, but others are more suited to warmer climates. These dogs get cold in extreme weather, and they’ll welcome a bit of warmth when they’re outside for long periods of time. Whippets, Greyhounds, Boxers, pit bulls, French Bulldogs, and all of the hairless dog breeds are in this group. And if you keep your dog’s normally thick fur meticulously short with grooming, he belongs here too. 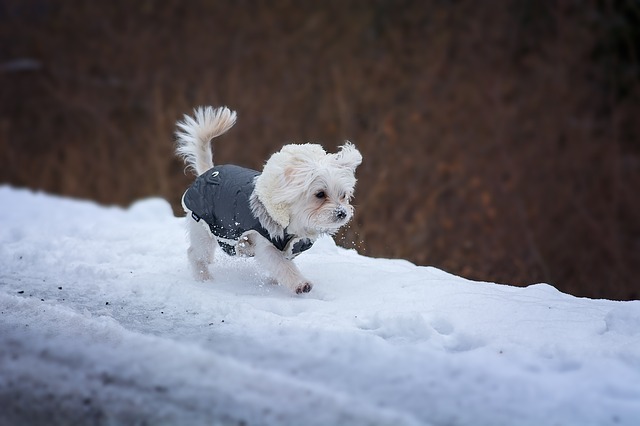 Small dogs and dogs that are low to the ground have a harder time keeping warm in winter weather. Little dogs like Chihuahuas and Rat Terriers don’t generate enough body heat to keep themselves warm when the temperature gets low, and even a few inches of snow can be like a mountain when you stand less than a foot off the ground. Dogs with long, short bodies, like Basset Hounds, Corgis, and Dachshunds, are also more susceptible to shivers because their short legs aren’t enough to keep their bellies out of the snow. They need dog coats that cover their sensitive tummies where their fur is shortest. According to AKC, senior dogs struggle to regulate body heat. It’s hard for them to hold on to body warmth, and they get colder a lot faster than they did back in their youth. For this reason, even dogs with thick fur sometimes need dog coats when they hit a certain age. Cold weather can also aggravate age-related health conditions like arthritis. Your senior dog will be more comfortable outside when he has the proper gear to keep him warm. Cushing’s disease, cancer, diabetes, kidney disease—these types of illnesses don’t mix well with cold weather. They compromise the immune system and leave dogs more susceptible to the winter chill. Dogs that are seriously sick shouldn’t be spending much time outside in the first place, but not every dog with an illness needs to be bedridden. If your dog is feeling well enough to have fun outside, you don’t have to keep him cooped up. Talk to your vet about how a dog coat will help him stay warm in winter. The best winter coat for your dog is one that keeps him covered from neck to tail. It should fit snugly but not restrict his movement. You’ll also save yourself from doing a lot of laundry if you find one that allows your pup to easily go to the bathroom. Choose something waterproof if you plan on spending a lot of time in the snow, and remember, not every dog will be okay with the bizarre feeling of wearing a jacket. Help him get used to it by having him wear his new coat only a few minutes at a time. If he desperately tries to escape the coat or adopts a “frozen” posture and refuses to move, it’s best to find other ways to keep him warm in cold weather. Does Your Dog Need Winter Booties? A dog coat is one thing, but what about booties? Paw pads are specially made to be tough, but do they really stand up against snow, ice, and frozen ground? The answer is, it depends on both your dog and the situation. 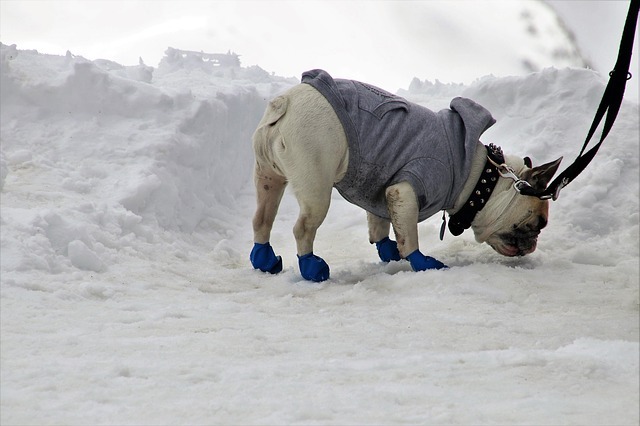 Under normal circumstances, dog booties aren’t necessary to keep your pup comfortable outside. Dogs are perfectly capable of enjoying the outdoors without footwear, but there are certain factors to consider. Paw pads are tough, but they’re not indestructible. Dogs get cuts and cracks on the bottoms of their feet, and dry winter air can make matters worse. A good organic paw wax will help keep your dog’s paws in good shape, but it isn’t a good idea to take long winter walks when your dog’s paws are already suffering. Open wounds will make them vulnerable to cold and also dangerous chemicals like those used in ice melt. A sturdy set of booties will protect their paws and speed up healing. This problem affects long-haired dogs and dogs with furry paws the most. You can help by keeping the fur between your dog’s toes nice and trimmed, but that isn’t always enough to stop the accumulation of ice. Dog booties are the most efficient way to solve the problem while still allowing your dog to have fun outside. Thanks to a thick layer of fat on the bottom of your dog’s feet, he can walk on cold surfaces for a relatively long time without feeling pain or discomfort. Trouble comes in, however, when the path you’re walking is coated in ice melt. AccuWeather says sodium chloride and calcium chloride, the main ingredients in ice melt, irritate dog paws. Taking a long walk on a sidewalk sprinkled with salt will do a lot of damage to your dog’s paws. It can even make him sick if he decides to lick his hurting paws and ingest the stuff. If you have no choice but to walk in an area that’s thick with ice melt, booties will offer much-needed protection. As with coats, wearing shoes isn’t a natural feeling for dogs. Most will take a few steps to get used to the extra weight on their feet, and some never get used to it at all. You should only put boots on your dog if he learns to accept them. It’ll be easier for him if the boots fit snugly so they don’t fall off, but you also don’t want them to be too tight. Traction on the bottom will stop slipping, and waterproof material is best for winter weather. Deciding whether or not your dog needs extra help staying safe and warm this winter should be based on his breed, size, age, and health, not how cute he looks in a dog coat. If you decide your dog needs extra layers to stay warm, it should be for practicable reasons, not fashionable. 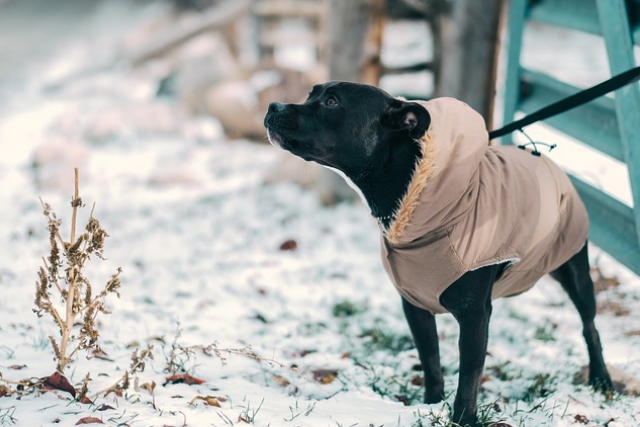 You might not need a dog coat or boots every day this season, but having dog-friendly winter gear could come in handy in emergency situations.